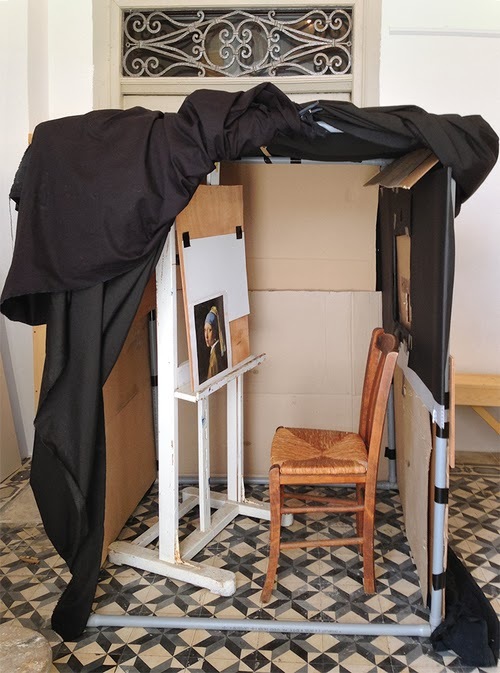 Jane Morris Pack, a painter and educator in Greece, has built a camera obscura to learn more about the methods that might have been used by Vermeer. Here's the first version that she tried out, using a modular frame and black drape. And here's her improved box with better light-shielding ability. On the left is an unedited image of the projection from within the camera, flipped 180 degrees, and on the right is the first painting, painted entirely from inside the box. Read the full story of Jane Morris Pack's Camera Obscura Project. Thanks, Jane! Thanks James. That posting was amazing. I'd recently seen "Tim's Vermeer" and was very impressed to see his exploration. To see Jane's experiment with the camera obscura is fascinating. It was great to see another viewpoint and attempt. Jane's imagery is very impressive using the camera obscura. Having been resistant at first, I find myself leaning more toward accepting that Vermeer likely used a camera obscura. But I also find myself caring less whether he did or didn't. Great picture making is great picture making. Period. My enjoyment is usually enhanced if I see the artist's "hand" more, but for me Vermeer is an exception to that personal rule. His composition and lighting are remarkable, regardless of how the image was made. It's like time-travel. However, I still think that Hockney overreaches in his assertion that tools like the camera obscura were widely used. Clearly we know that there are artists today - as there surely were in ages past - who could paint very realistic images without using optical tools like the camera obscura. Tom, you said it so well, and I completely agree. I read Mr. Hockney's book expecting to discount it completely. But I feel there is a germ of truth to it. It's not surprising that artists have always been on the forefront of any form of visual tools, be it lenses, photography, film, or CGI. What Hockney doesn't see to grasp is how well trained artists without any recourse to lenses can produce a "photographic" image if they wish to. Therefore one must be extremely skeptical about claims made about Vermeer's methods. With regard to this post, I think it's wonderful that J. M. Pack has done this experiment to take the discussion from theory to practice. Eric, thanks. A lot of people have recommended Tim's Vermeer, and I just haven't seen it yet. I personally don't buy Hockney's theory that Veermer used a camera obscura - primarily because there was no evidence amongst his possessions after his death. The main reason I read the book was because I was building a camera obscura at the time. I haven't used the thing in ten years, but if you catalog and sell off my possessions to pay my enormous debt (as was done with Vermeer) you'll find a pile of thrift-store glasses with one lens, a half-dozen cardboard-and-paper cameras obscura, and one unintentionally-steampunky camera obscura. So, if Vermeer used one everyday of his life, during a period when the lenses would have been worth a great deal, there would have been evidence of optics amongst his possessions. But, I also agree with Tom, the camera is just a tool and it doesn't matter if he used one or not - the work speaks for itself. I've been looking into Canaletto's use of the camera obscura, since many of the landmarks in his paintings still exist, as do sketches supposedly made from a camera. What I've have found so far is that he seemed to used it mostly as a quick way to get certain a topological accuracy within segments of a much larger scene, but ultimately departed from those sketches by resizing numerous individual elements in order to balance the final composition. In other words, he appears to have used the camera as a measuring tool, then pretty much ignored those measurements. What is also apparent, is that no lenses of his day would encompass the super wide angle views of his paintings; and many of his constructed perspectives, though perfectly natural at first glance, are in fact impossible to achieve from a single vantage point. Furthermore, in at least one painting I've studied, the sun is seen coming from the North – from an angle that could never have occurred. Thus all the highlights and shadows are not observed, but completely imagined. Some scholars insist much of what we see in Vermeer's paintings are imagined. When one thinks of what it would take to change out the floor tiles, for example, or acquire expensive props like a virginal or chandelier, there's not such a big advantage to using a camera over an artist who can add right-sized elements as needed from field sketches or other references; apply light effects from memory (or habit), or by extrapolating the effects of light by using similar objects at hand. I'm sensitive to his problem because as a photographic illustrator, I have to have everything in front of the camera. The camera can just sit there for days or weeks as I either acquire or build props from scratch. So, as much as I admire Jane Morris Pack's hands on approach to her inquiry – especially that she actually produces paintings – I don't see Vermeer setting up all the props in his studio like a modern day photographer if he didn't need to do so. And given that he lived during the golden age of Dutch painting in a community thick with world class painters and perspectivists, it's not clear that such a need would have been as great then as we assume today. Just as Ms Pack's students quickly dispensed with the 45 degree mirror in front of the lens, I think a painter of Vermeer's caliber would quickly dispense with giant box camera entirely, if he had one at all. I agree with Tom Hart that in the end it doesn't really matter how he got there, but I've gained a lot of insight from my inquires into Canaletto, and I value Ms Pack articulate experiments too, even though I'm moving in the other direction with regard to Vermeer. I appreciate the comments and conversation which this posting has provided. The camera obscura is a simple model of the human eye but has many limitations which the eye does not. No one would argue the human ability to paint nearly photographically real with training and diligence. But before the 17th century few had seen through a lens and the comparison would not be made. Using a camera obscura forces certain limitations which can become the basis for creative decisions. Certainly the work I am doing could be done without using the camera but I am interested in how the camera changes my vision and handling as a painter. We may assume that the early works of Vermeer such as "Diana and Her Companions" were done before the use of a lens. Once Vermeer begins to use it, perhaps first with "Girl Reading a Letter at an Open Window" his perspective changes.The camera obscura has a fixed position and cannot look down into a scene as the human eye can therefore the tabletops are in very flat presentation straight across from the lens. Notice the difference in his table top from "The Procuress" which seems to rise unnaturally up toward the young woman seated at the table. Also his distance from the scene increases and we no longer have the figures crowding the frame. The reduction of forms in space and the neutralization of color are elements which the camera makes plain and which the eye more easily overlooks as it can adjust for distance where the camera cannot. Most people can distinguish between a work by Vermeer and one by his contemporaries. The difference is not that one painting is more carefully observed and rendered but how abstracted and structured it is. These are the strengths of the camera obscura rather than the human eye and contribute to the sense of removal and distance which characterize the work of Vermeer. As I stated in my paper, I strongly believe that only a trained artist can really put the camera obscura to use as it does not create paintings magically for you. Therefore I do not understand the objections to its use by Vermeer. Rather than a form of cheating, it is merely another vision of the world. 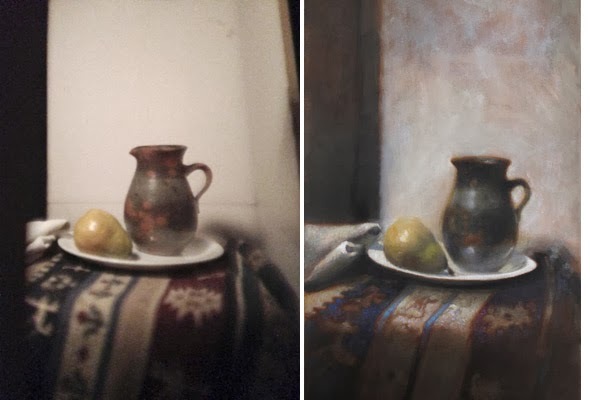 If my paintings were now as good as Vermeer, which they certainly are not, there might be a basis for objection to claiming his use of a camera obscura. It would make him less a genius whereas I find him to be more so after my experiment. As far as the issue of there not being a camera obscura listed in his household effects, it is possible he was loaned a lens by Leeuwenhoek which returned to its owner after Vermeer died. The box itself is such a simple construction that it may have been taken apart and burned for firewood. The proof if there is one, lies in the examination of his work, not in the list of his possessions.